Did You Get A Haircut? No, I Got Them All Cut! It’s a little after noon and the temperature is rapidly climbing to the 80’s. As of this moment there is no plan for the day, but life here is always full of surprises. Susan is off having her nails done and on the way back she will check in with Teresa at A Nou to see if she has anything she would like to add to or subtract from Susan’s article about her and the restaurant. If all goes well, she should post the article soon. Yesterday after completing my physical therapy session I decided that I would go in search of the barber and barbershop that a friend, Pepo, had recommended. I searched the Internet for an address and did not find anything. I asked Pep for the address and he was not sure of the street name, but he did mention that it was close by the Westin Valencia. I hopped a cab and had the driver drop me off at the front door of the hotel. I walked past the front door of the hotel until I got to the corner and hung a left there. I walked no more than fifty feet and I saw the sign that read Peluqueros Beltrán. Success! When I walked in both barber chairs were occupied so I took a seat and waited. It took no more than five minutes for me to get into the chair. I introduced myself to Miguel Beltrán and told him that Pepo had sent me. It turns out that his children and Pepo’s children go to the same school and they are roughly the same age. I explained to him what I would like him to do with my beard and then to cut my hair so that its length goes well with the length of my beard. He understood perfectly when I told him that I wanted to keep the shape and contour of my beard; I just needed to have it thinned out. We chatted while he worked away. The barbershop was started by his father who is now retired. Miguel began to work there when he was seventeen and has been cutting hair for some thirty-one years. He has two daughters one of whom is sixteen and the other is eleven. For a while he entertained the idea of working in a beauty salon, but decided that the idea of looking after three customers simultaneously was way too stressful. Cutting men’s hair is much less complicated in that you only have to deal with the person who is in your chair at the moment. I went for the whole nine yards and Miguel cut my hair, trimmed my beard, gave me a shave and finished the job off with a thorough shampoo. The treatment cost me 22.5 Euros. He did a great job and the good news is that I have finally found my barber in Valencia. Susan and I had lunch at La Fórcola and, as usual we opted for the menu of the day. Susan and I both started off with a rather large bowl of mussels and then followed that up with a pizza for me and a pasta for her. I had some ice cream for dessert and Susan chose the cheesecake. We passed on coffee and a liqueur because we needed to get changed and meet Juanra in his office for a 4:30 appointment. Juanra is in his mid-20’s and has been working at Kermocasa for some three years. He works alongside his mother, Sylvia, who has been in the real estate business for a goodly number of years. They have recently moved into a new office space that is small, but very impressive. We chatted for more than an hour as Juanra explained the process and took information about what exactly we were seeking in an apartment. We designated three areas of the city in which we were interested and described what our ideal apartment would contain. In the next month or so he will send us information on some apartments that are available to give us an idea of how the process works and to see if we see something that fits our wishes. At the end of June and after he will begin to seriously search for available apartments that we can rent as of October 1. Our goal is to have everything in place when we return to Valencia in November. Our appointment ended a little before 6:00 and from Juanra’s office we made our way to the Palau de Música for a family concert entitled Mágico Cumpleaños. All the promotional material indicated that it was recommended for children ages five and above. However, since this is Spain the age range of the audience was three months to ancient. The good news is that the audience was remarkably well behaved throughout the performance. Our friend, Nacho Diago, was the narrator and in addition to his interaction with the audience he performed a number of magic effects. The standout for us was his version of the Linking Rings done to the music of Dukas’ The Sorcerer’s Apprentice. It was beautiful to behold. The orchestra’s selections were aimed at the younger members of the audience, although Susan and I enjoyed them thoroughly. The fragments played included Young Person’s Guide to the Orchestra, The Moldau, The Sorcerer’s Apprentice, Waltz of the Fishes, The Fire Dance, The Flight of the Bumblebee, Dances from West Side Story and Pictures at an Exhibition. The event lasted a little more than an hour and we all left the theater in the happiest of moods. It was 8:00 PM when we got home and after a rather busy afternoon we decided that we were in for the night. We read and watched some TV and headed for bed a little before midnight. 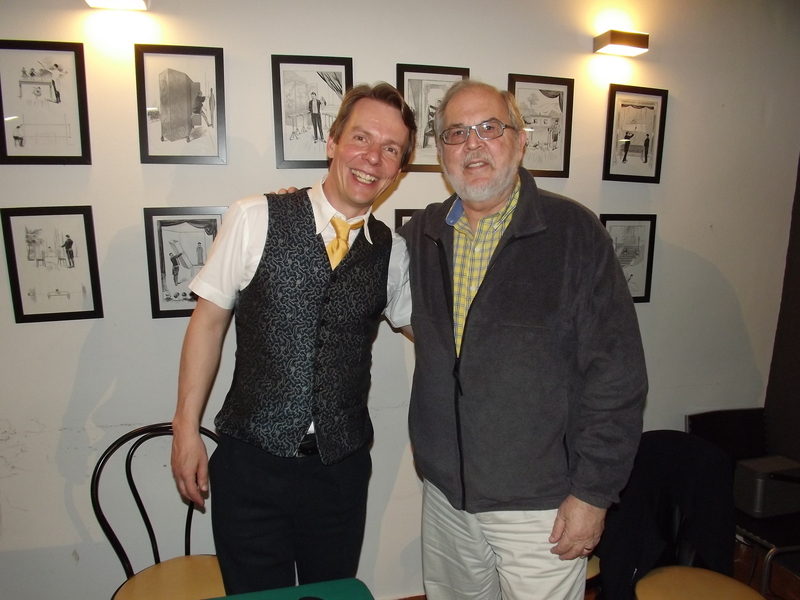 There is only one picture today and it is of me with Jörg Alexander taken last Monday at his lecture.